Our Spring 2019 Learn to Skate USA Session begins on Monday, March 11th and runs for 8 weeks. We have classes for ages 3 through adult. Whether they dream of becoming a competitive figure skater, joining a hockey team, or just skating for the fun of it, Learn to Skate USA is the place to start! You can choose to sign up for lessons on either Monday or Thursday nights — or sign up for both and get the second night at 1/2 price! For this session that’s a savings of $52.00! Classes run from 6:00 – 6:50 pm and include a 20 minute lesson, 20 minutes for Practice/Warm Up and 10 minutes for large group activities. Last 10 minutes (6:40 pm – 6:50 pm) are geared toward larger group activities with all levels. For full details on the Learn to Skate program, please click here. You can register online or plan to register on the first night of classes. A registration table will be set up on March 11th and 14th at the door. Be sure to arrive at least 30 minutes early to register and get skates on. Don’t have your own skates? That’s no problem! You can rent them from the arena for $1.00 per class. (reduced rate). Click on the links below to register online or print out a PDF of the registration form. *All new enrollees for this year will also need to pay $18 for an annual Learn to Skate USA Membership Fee. Pro-rated registration is available for those who sign up after the first week of classes. Children ages 5 and under are required to wear a helmet on the ice. (A bicycle helmet is acceptable). Single Bladed skates are required, either figure or hockey. No double bladed skates will be allowed. For full details on our Learn to Skate USA Program click here! If you have any questions please email us at MtPleasantFSC@gmail.com or call (989) 817-2485 and leave a message. 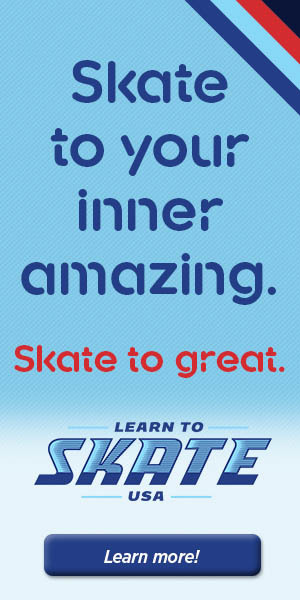 Learn to Skate USA is the only ice skating program endorsed by U.S. Figure Skating, USA Hockey, and U.S. Speedskating.